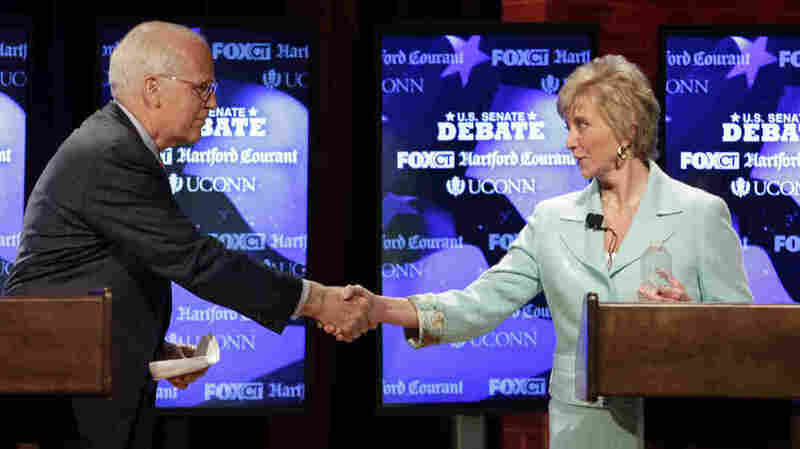 Favored In GOP Senate Primary, Linda McMahon Faces Critics Left And Right : It's All Politics Former World Wrestling Entertainment executive Linda McMahon is making her second run for a U.S. Senate seat in Connecticut. Once again she is campaigning with primarily her own millions. And her opponents again say she can't separate herself from the controversial side of professional wrestling. Connecticut GOP Senate candidates Rep. Christopher Shays and Linda McMahon shake hands at a June 14 debate in Storrs. State Republicans vote Tuesday on which candidate will move on to the general election. Two years ago, Republican Linda McMahon ran for an open U.S. Senate seat in Connecticut, spent $50 million of her own money in the process, and lost. In an otherwise Republican year, the former top executive at World Wrestling Entertainment was easily beaten by Democrat Richard Blumenthal. Now, McMahon is trying again — running for the seat of outgoing Sen. Joe Lieberman, an independent. McMahon faces former Rep. Christopher Shays in Tuesday's GOP primary. Polls have shown McMahon as the front-runner. Should she make it to the general election, she'll face the winner of Tuesday's Democratic primary between Rep. Christopher Murphy and former Connecticut Secretary of the State Susan Bysiewicz. Polls have shown Murphy with a commanding lead. McMahon's critics call her a big-spending political novice trying to buy herself a Senate seat — a strategy that may work in a primary but didn't work in the general election two years ago. McMahon says she has a grass-roots operation she didn't have two years ago. "By November, we will have knocked on half a million doors and made a million phone calls, touch points to our voters," McMahon says. Shays says he is running because he wants his country back. He also says he wants to take the GOP back from the people who supported McMahon in 2010. "There's really nothing different about her campaign [in 2012 compared with 2010] except the fact that she's saying, you know, 'I'm a softer, nicer person.' She's the same person. She made her money in the WWE," says Shays. "In order to make more money in the WWE, they got further down in the gutter. That's not the kind of candidate that I think this Connecticut Yankee state is going to elect." State Democrats are making the same argument. They have featured advertising that includes a World Wrestling Entertainment skit in which a woman is berated by McMahon's husband — Vince McMahon, CEO of the WWE — who incites the crowd at an event by telling the woman to bark like a dog. McMahon counters with female supporters of her own. "What we see in Linda is this person who is not a professional politician. She is a job creator, and she also understands the challenges that we as women have," says supporter Kathy McShane, who says she is attracted to McMahon's personal narrative as a professional who balanced work with children and then grandchildren. "And I just feel that we need somebody who has a different resume." Former Rep. Rob Simmons, a Republican who lost the state party nomination to McMahon in 2010, thought he had the resume to bring him to the Senate. Instead, the Vietnam veteran is taking a break from chipping wood at his Connecticut home, sipping a cold glass of water — talking about the race he lost and the woman who beat him. This time, he says McMahon is running the same, top-down, money-heavy race she did two years ago. He cites polling that shows nearly as many people who have heard about her don't like her as those who do. "Are these suburban and rural areas going to be enthusiastic about a person who has made a ton of money in an industry that glorifies violence, bullying, aggression and violence against women, drug use?" alleges Simmons. Simmons also has one very simple question: "Can this kind of candidate win?" The answer to that may still be two months off.